The Ricoh Aficio MPC3002AD replaced the old Ricoh Aficio MPC3001 photocopier, bringing a new dimension and adding a refreshed look to an already impressive feature set served up by the old model. This unit prints, copies, and scans. Plus, it has optional fax features for additional functionality. The Ricoh Aficio MPC3002AD colour multifunction printer delivers a rate of 30 ppm in black or colour, and it is easy to use and operate, even for novices. It supports full colour operation and is network ready. 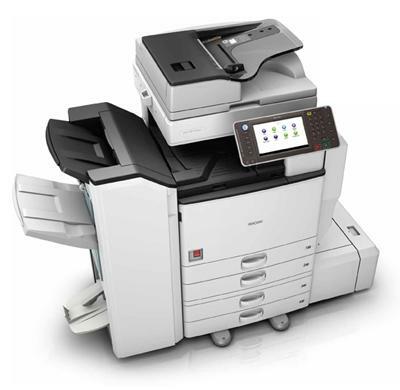 However, the Ricoh MP C3002AD MFP only offers optional fax and is bulkier than other MFP's. The Ricoh Aficio MP C3002AD colour laser copier takes a typical laser printer and copier design. It has an LCD panel with intuitive controls for easy menu navigation, and it features 1.5 GB of RAM and a 250 GB hard drive for smooth operation. The Aficio MCP-3002AD laser printer is network ready and it can be used with popular operating systems, including Windows, Mac, and Linux. One of the main advantages of the Ricoh Aficio MPC3002AD colour copier is its full colour capability. It has full colour scan, print, and copy features. The device allows direct scanning to USB. The Ricoh Aficio MPC3002AD colour laser printer even offers fast print rates averaging 30 pages per minute. Long-lasting toner cartridges for the Ricoh Aficio MP C3002 colour multifunction copier offer good value for money, capable of producing up to 28,000 for black or 18,000 pages per colour cartridge. Unfortunately, the Ricoh MPC3002 colour photocopier only offers fax as an optional upgrade. It is also quite bulky for small offices, although it is still a manageable size even for small workgroups. Nevertheless, the MP C3002AD copier is a good choice for high-volume print environments in need of an all-around unit that scans, prints, and copies.